Bone fishhook from Everhart Rockshelter. Returning home by air from a recent trip to Michigan, I was once again struck by the abundant waterways that bisect our little state. The Susquehanna, Potomac, Choptank, Patapsco and Patuxent are the major state rivers that empty into the Chesapeake Bay, the largest estuary in the United States. Overall, between Virginia and Maryland, more than 100,000 streams, creeks and rivers wind through the Chesapeake Bay watershed (Chesapeake Bay Program 2014). These waterways are the source of the fish and shellfish that have made the words “Maryland” and “seafood” all but synonymous. The thought of Maryland’s fishing industry is likely to bring up images of commercial vessels with trawl nets or sports fishermen hauling in citation weight rockfish from the back of a charter boat. 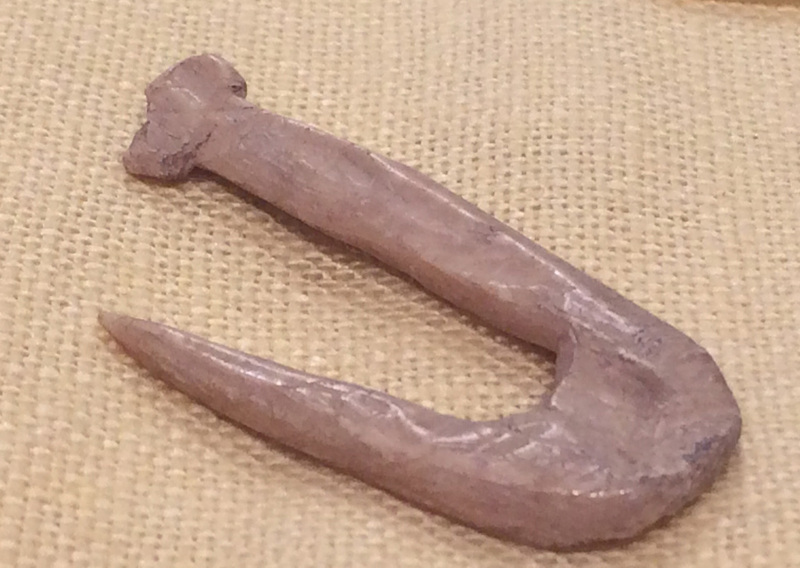 But this week’s artifact, a diminutive carved bone fish hook from the Everhart Rockshelter (18FR4) in Frederick County, reminds us that fishing has long been an important part of Maryland’s past (Figure 1). This rockshelter, which was excavated by Spencer Geasey in the early 1950s (Geasey 1993), was occupied for thousands of years, all through the Archaic (7500 B.C. – 1000 B.C.) and Woodland periods (1000 B.C. – A.D. 1600). One of the rockshelter residents must have used this fish hook to catch dinner from nearby Catoctin Creek. John White watercolor of Native Virginians fishing. The American Drawings of John White 1577-1590, courtesy The University of North Carolina Press. 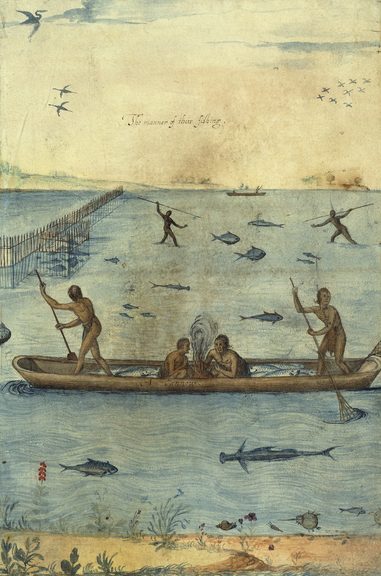 Maryland Indians also used spears and weirs for catching fish, as shown in John White’s late 16th-century watercolor (Figure 2). European settlers, too, were quick to reap the bounties of the creeks, rivers, and Bay. Colonial inventories list various pieces of fishing equipment, although they were usually quite minimal in the seventeenth century, like George Marshall‘s “old fishgig” (Marshall 1675), John Garnish’s “5 fishing lines” (Garnish 1679) or John Haskins’ “17 fish hookes” (Haskins 1700). Use of hook and line remained the most common form of colonial fishing, although the use of seines began in the second half of the 18th century (Casey 2014). It wasn’t until the latter half of the 19th century that fishing became a mainstay of the economy in Southern Maryland (Newman 2009). In 1890, the U. S. Fish and Wildlife Service stated that over 36 million pounds of finfish were taken from the Chesapeake Bay (Casey 2014). The Commissioners of Fisheries in Maryland was established in 1874 (Minkkinen 2014). One of the first programs introduced by the Commissioners (1875) was the creation of fisheries for Pacific and Atlantic salmon, in the hopes of introducing the species into the state (Minkkinen 2014). This effort was ultimately a failure, but a program of trout hatcheries begun several years later met with more success. 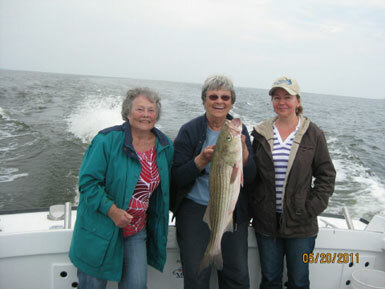 Unidentified women with rockfish. Photo from Southern Maryland Chapter Maryland Saltwater Sportfishermen’s Association website. Website accessed September 5, 2014 at http://www.mssasmc.com/photos.htm. In addition to oysters and crabs, Maryland’s watermen also bring in a variety of fish, including red and black drum, menhaden, perch, bluefish, Atlantic croaker and, of course, rockfish. The rockfish (Morone saxatilis) was named the official fish of the State of Maryland in 1965. Sport fishing is a significant revenue generator for the state. In 2010, the Maryland Saltwater Sportfishermen’s Association placed the value of recreational fishing at over one billion dollars (Baltimore Sun 2010). In 2012, 6.2 million residents of the Eastern Seaboard went out on 38 million fishing excursions in Atlantic marine waters; almost six percent of the trips were in Maryland waters (NOAA 2012). Baltimore Sun. 2010 Maryland’s billion-dollar recreational fishing industry–times 11. Candus Thomson. Outdoors Girl, December 3, 2010. Baltimore Sun. website accessed September 5, 2014 at htttp://weblogs.baltimoresun.com/sports/outdoors/blog/2010/12/marylands_billiondollar_recrea.html. Casey, Jim. 2014 A Short History of Commercial Fishing in the Chesapeake Region. Website accessed September 8, 2014 at http://dnr2.maryland.gov/fisheries/Documents/history_of_comm_fishing.pdf. Chesapeake Bay Program. 2014 Bay FAQ. Chesapeake Bay Program website, accessed August 18, 2014 at http://www.chesapeakebay.net/faq/keywords/rivers_and_streams#inline. Garnish, John. 1679 A true and Perfect Inventory of all and Singular the goods and chattels of John Garnish of the Citty of St. Maryes. Maryland Prerogative Court, Inventories and Accounts, I & A6, f 547-560, Maryland State Archives, Annapolis. Geasey, Spencer O. 1993 A Comparative Analysis of Flaked Lithic and Ceramic Assemblages from Three Rock Shelters in Frederick County, Maryland. Maryland Archeology 29(1&2):43-53. Haskins, John. 1700 An Inventory of the Estate of John Haskins Son of St. Marys County. Maryland Prerogative Court, Inventories and Accounts, I & A 20, f. 29-30, Maryland State Archives, Annapolis. Marshall, George. 1675 An Inventory of George Marshall Estate, Maryland January 15, 1675. Maryland Prerogative Court, Inventories and Accounts, I & A II, f. 5-8, Maryland State Archives, Annapolis. NOAA. 2012 U.S. Marine Recreational Fisheries. Fisheries of the United States, 2012. Commercial Fisheries Statistics. Website accessed September 5, 2014 at http://www.st.nmfs.noaa.gov/commercial-fisheries/fus/fus12/. This entry was posted in Archaeology, General and tagged archaeology, artifact, Chesapeake Bay, commerical fishing in Maryland, Commission of Fisheries in Maryland, everhart rockshelter, Frederick County, Maryland, Maryland trout hatcheries, rockfish. Bookmark the permalink.